Les films de Jennie Inc.
French painter Jacques Monory, opens his Paris studio to the camera. He evokes the obsessions of a lifetime: monochrome, philosophy and…revolvers. Now in his seventies, the artist is at peace with his legacy. A compelling look into the life and work of a major player on the contemporary art scene. The imaginary life of Jacques Monory is presented at the inauguration of the new Museum of Contemporary Art in Val-de-Marne, with the exhibition Jacques Monory (France) in November 2005. It was then presented at the Cinéma des Cinéastes in Paris (France). 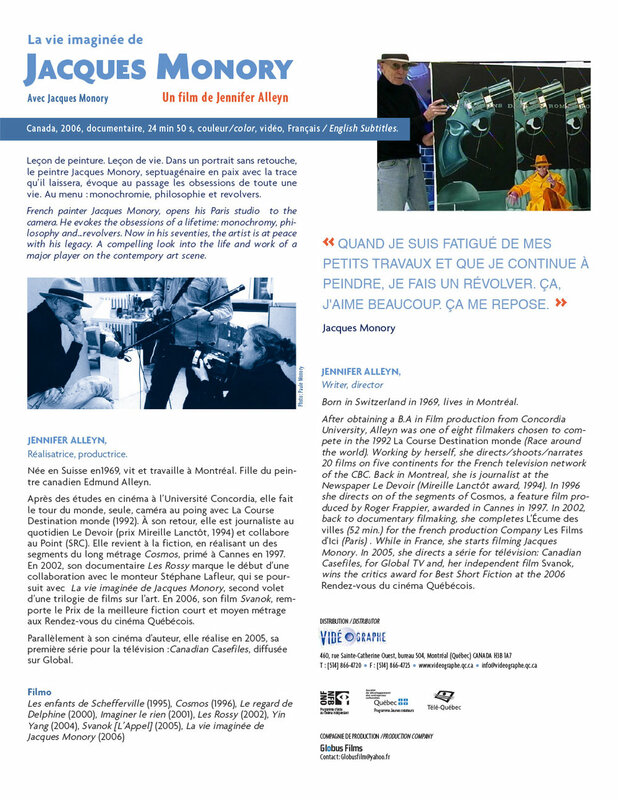 In Montreal, he was shown at the Ex-Centris Parallel Cinema for two weeks and received critical acclaim (November 13-23, 2006). Vancouver International Film Festival and Acadian Francophone Film Festival 2006. Broadcasted on Télé-Québec in 2006.